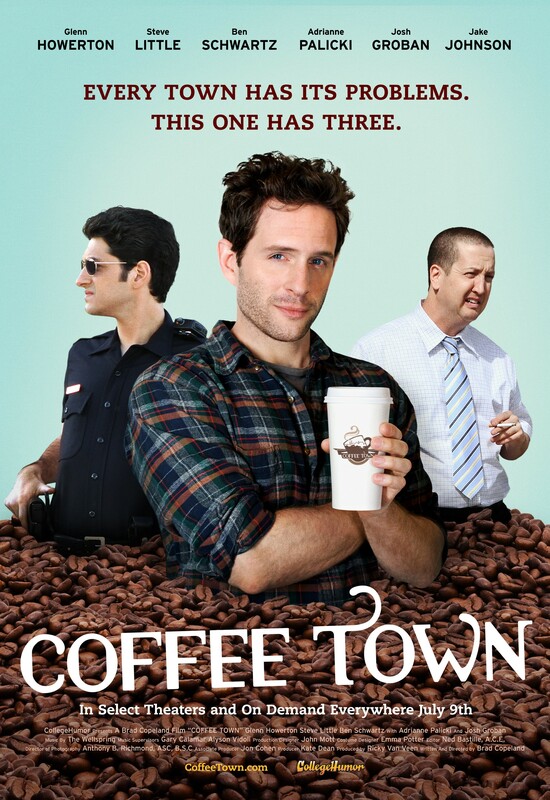 CollegeHumor’s COFFEE TOWN gets first trailer and poster. Josh Groban can’t sing? CollegeHumor is known for bringing the funny and now they are about to release their first full length film. The film stars Glenn Howerton of It’s Always Sunny in Philadelphia fame, Steve Little from Eastbound and Down, and Ben Schwartz of Parks and Recreation as they race to save their local coffee house from being turned into a neighborhood bar and thus erasing their freeloading lifestyle as this particular coffee house doubles as their office. The film also stars Adrianne Palicki (G.I. JOE: RETALIATION) and the man with the golden voice, Josh Groban (CRAZY, STUPID, LOVE). I can’t be the only one who finds it hilarious seeing Josh Groban giving his best “bad singer” performance. COFFEE TOWN is directed by Brad Copeland and stars Glenn Howerton, Steve Little, Ben Schwartz, Adrianne Palicki and Josh Groban. SYNOPSIS: The first feature film from comedy leaders CollegeHumor, “Coffee Town” is an updated workplace comedy for the generation that works out of coffee shops. Will (Glenn Howerton) is a 30-something website manager who uses a local café, Coffee Town, as his office. When the owners of the shop discuss plans to convert Coffee Town into a bar, Will enlists the help of his two best friends Chad and Gino (Steve Little and Ben Schwartz) to save his freeloading existence. In order to thwart the plans of Coffee Town’s owners, the trio stages a robbery to create the illusion of an unsafe neighborhood not suitable for the proposed venue. Also standing in their way is Sam (Josh Groban), a disgruntled barista with delusions of rock star grandeur, and Will’s heartache over unrequited love for Becca (Adrianne Palicki). Written and directed by Brad Copeland.